The pen is still the most popular promotional item available today, second only to promotional bags. 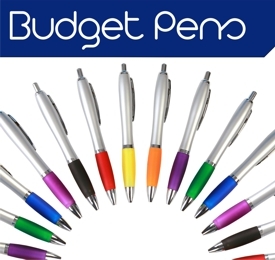 With some fantastic advances in technology even a budget plastic pen has huge scope for personalisation and branding, with full colour wrap, photo quality printing and HD printing that you can touch, now readily available. The promotional pen have never been a stronger medium for carrying your message. At The Advertising Gift Works we know that the products you give to your customers are a direct representation of your company, so even when it comes to budget products we only ever supply the very best quality to meet your budget and requirement. Selecting a quality plastic pen has never been easier. 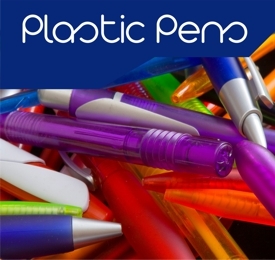 Just pick from our hand picked selection of quality plastic pens and with a vast range of style, colours, designs and branding options available we are sure you'll find the perfect products to meet your requirement. The plastic pen is a staple item in every office, garage, reception desk and conference across the globe and its appeal is clear. Easily personalised, great branding potential and a vast range of style to choose from, here at The Advertising Gift Works we are sure we can help you find the very best product for you. 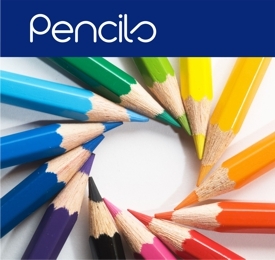 Pencils, a staple of the pencil case and a fantastically practical and low cost giveaway are available here in this hand picked selection. Pick from a wide choice of colours, styles, finishes and sizes and find the very best products to meet your requirements. Be it for a exhibition, a eco event or the education sector, this versatile products can be personalised to match any corporate theme or style. Pick from our range of pencil and colouring pencil sets and find the very best products to meet your requirements no matter what the occasion. Perfect as a corporate gift or quality give-away this hand picked range of metal pens boasts a wide variety of styles, finishes, qualities and colours with a variety of finishes available like laser engraving, screen printing and tampo (pad) printing, personalising a quality gift or giveaway has never looked better. Our selection of metal pens can also be supplied with bespoke and custom packaging for that extra level of personalisation and added value. Presenting the perfect personalised products for any occasion doesn't have to be difficult and we’ve just made it that much easier. If you'd like to see our entire range of pens, pencils and writing instruments - Click here! Within our range of hand picked products you will find the most popular styles and designs from the most popular budget Contour or Curvy pen right through the range to the classy and iconic Parker Jotter. Pen are still up there as the most popular promotional product second only, at the moment, to promotional bags and this is for good reason. Even with the advent of touchscreen devices and smartphones the pen has stay strong by adapting its features and styles, clearly visible with the introduction of stylus touch screen nibs making the pen the staple promotional item that everyone wants. No matter where you are it won't be long before you stumble across a branded pen normally a free giveaway or handout it is a practical products and as we know, practical products perform best. With huge advances in print technologies over recent years the brand options are almost endless, from traditional one colour print to the barrel, you can now pick from, 2 colour, 3 colour, full colour, digital photo quality images, 360’ wrap around print, we can print on the clip and on the lid, we can print in HD which actually stands out from the surfaces of the pen allowing you to feel the detail. The possibilities are seemingly endless and will only become better and more detailed as the technology improves. The days of ordering a pen and it looking the same and the pen on the event stand opposite are long gone. Now, anything is possible.